The Recording Academy® will kick off the announcement of the 58th Annual GRAMMY Awards® nominations Monday, Dec. 7th by revealing the nominees in the four General Field categories (Best New Artist, Record Of The Year, Song Of The Year, and Album Of The Year) live on “CBS This Morning.” Immediately following, at 8:30 a.m. 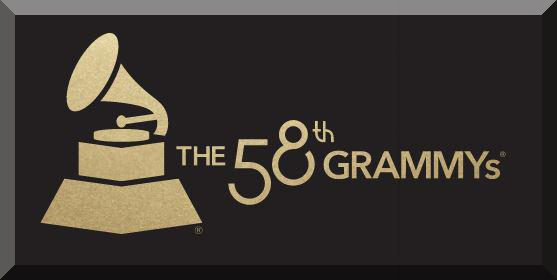 ET, nominations across all 83 categories will be announced via press release and made available on GRAMMY.com. GRAMMY Week — a weeklong series of cultural events culminating with Music’s Biggest Night — will again feature celebrations of music, education and philanthropy, including the annual MusiCares Person of the Year tribute, Clive Davis’ and The Recording Academy’s Pre-GRAMMY Gala, the Special Merit Awards Ceremony & Nominees Reception, the Producers & Engineers Wing event, and the Entertainment Law Initiative luncheon, among other events. This edition of the Grammy Awards presentation will mark the first time the ceremony will be held on a Monday, after several years when the awards were presented on Sundays. The move is said to be temporary, as this edition will fall in an American holiday weekend (15 February will be President’s Day), and the Grammy organization opted for a ceremony to be held at the end, rather than in the middle of, this long holiday weekend. In addition, the move also avoids the ceremony facing stiff ratings competition from AMC’s hit horror series The Walking Dead. Follow The GRAMMYs on Facebook and Twitter, and use @theGRAMMYs or #GRAMMYs to join the conversation. The Academy’s mission statement is simple, but represents the heart and soul of the organization’s efforts: to positively impact the lives of musicians, industry members and our society at large.